The design of this clever reclining loveseat keeps dimensions modest to accommodate all types of homes while still including two seats and a storage console. The reclining loveseat is available with a space saver or rocking mechanism, and power upgrade is available for both. 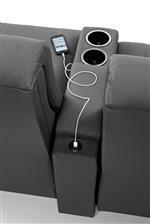 The power console loveseats include built-in USB charging ports for powering up your devices. The Codie Power Rocking Reclining Loveseat with Storage Console and Cupholders by Best Home Furnishings at Best Home Furnishings in the St. Louis, Chesterfield, St. Charles, MO & Waterloo, Belleville, Edwardsville, IL area. Product availability may vary. Contact us for the most current availability on this product. The Codie collection is a great option if you are looking for Casual furniture in the St. Louis, Chesterfield, St. Charles, MO & Waterloo, Belleville, Edwardsville, IL area.